Sinn Féin TD for Wicklow/East Carlow John Brady has said that the concerns surrounding the sale of Ardmore Studios, Bray have been discussed with the Minister for Jobs, Enterprise & Innovation, Mary Mitchell O’Connor following his successful request for a meeting. “Having sent a number of letters raising concerns about Ardmore Studios to both Minister Mitchell O’Connor as well as Minister Humphreys, I was happy to attend a meeting with the Minister this afternoon. “The Minister has confirmed that the State’s interest in Ardmore Studios remains in place. The State are not willing to sell their almost 32% share in Ardmore Studios and I welcome this confirmation. 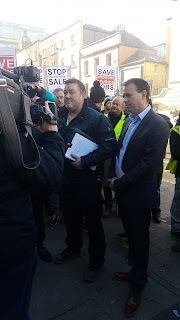 “There were also fears that Ardmore Studios would be on the market as an unconditional sale as oppose to as a going concern – this has been rejected and Minister Mitchell O’Connor has given assurance that Ardmore Studios is being sold as a going concern. “The Minister has also confirmed that protections are in place to prevent asset stripping of Ardmore and protections for staff. “I welcome that Minister Mitchell O’Connor has also agreed to my request that she will meet with a delegation from Wicklow County Council as well as workers from Ardmore Studios within the next fortnight. “The second round of bidding for Ardmore is expected in the New Year. The Minister has said that the State will not be forced into selling their shares or have the State any desire to do so, and their primary role is to protect and grow the film industry in Wicklow.